How do I ensure my banking information is safe? The SRECDelaware site is protected by a 128 bit SSL security certificate and all account transactions are conducted using an SSL secured connection with data stored in an encrypted database. 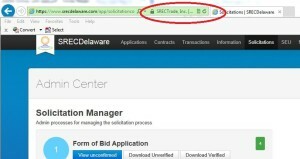 You can verify that a proper SSL connection has been established by looking for the green indicator in the URL section of your browser bar with a locked lock symbol followed by “www.SRECDelaware.com” This indicates that you are connected to the legitimate SRECDelaware website run by InClime on behalf of the Delaware Sustainable Energy Utility, and that your data is encrypted before being sent over the internet. How do I get answers to questions not addressed here? Questions can be submitted at any time here. 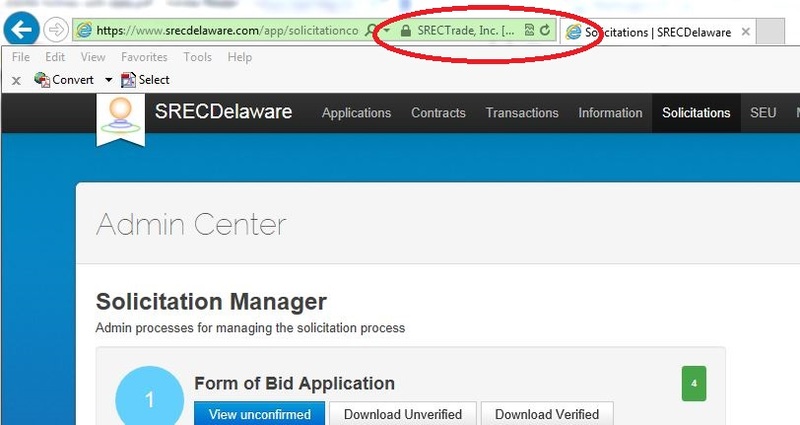 All questions that are submitted will be posted in the FAQ or Announcements section of the SRECDelaware website so that all bidders have access to the same information. How is my contract price determined? All applications are competitively bid. Contracts are awarded at the price bid plus Delaware parts and labor bonus if applicable. In the following scenario there is only room for two contracts, but three facilities have bid. Facility A bids in at $100/SREC and has Delaware parts and labor. Facility B bids $50/SREC without Delaware parts and labor. Facility C bids $110/SREC without Delaware parts and labor. Facility A is awarded a contract of $100/SREC but is paid $120/SREC for the first 7 years. Facility B is awarded a contract of $50/SREC and is paid $50/SREC for the first 7 years. Facility C is not awarded a contract. Contracts are awarded to lowest bidders, ranked by “bid price,” regardless of the Delaware parts and labor price adder. I just completed my application, however the “STATUS” section is only showing the application as 75% complete. Am I missing something? No, if you don’t owe a bid deposit. Yes, if you do owe a bid deposit. All applications initially show 75% complete when submitted by the applicant. They will switch to 100% once SRECDelaware staff has verified the application complete and any necessary bid deposits have been received and credited. Bid deposits are required for facilities that do not yet have Delaware certification number. When will applications for the 2014 solicitation be accepted? SRECDelaware.com will accept applications from May 5th to May 27th. When will results for the 2014 solicitation be released? Results are anticipated to be posted on May 27th. Full results may not be available at that time in the event of bid ties or partial bid fills. Will I have a better chance of winning if I enter my application early in the bid window? All tiers of the 2014 solicitation will be determined by bid price. There is no bidding advantage gained by entering a bid early in the May 5th to May 23rd bidding window. However, we encourage you to enter your bid as early as possible since that will give us time to identify and work with you to correct any errors or omissions. Also, keep in mind that bid deposit wires must be initiated by 4:00 PM EST on Friday, May 23rd. Can I enter again if I did not qualify in a previous year’s Procurement? Yes. All bids must be re-entered, but systems that applied and were not accepted in previous solicitations are free to enter again in this solicitation. Can I enter multiple bids for one location? Only one bid can be entered for all the systems on a given parcel. If several systems have already been built on a parcel, they should all be bid as a single system. Can systems located in a muni or co-op service territory participate? Yes. Any system with a DE certification number can participate. Do I need a revenue grade meter on my system to apply? No. Systems simply need to have a revenue grade meter installed once they’ve won a contract. They do not need a revenue grade meter installed to bid. By selecting that a given system has a revenue grade meter on the application, you are committing to having a revenue grade meter installed for any SRECs delivered under contract (SRECs produced from June 2013 production onward). Do I need an interconnect agreement to bid? No. Proposed systems bidding in the “N” tiers do not need to be interconnected prior to applying. Systems without a DE certification number must provide the required bid deposit. Accepted systems have one year after the solicitation closes to complete their projects. Do you accept applications from solar systems in (PA, NJ, VA, FL….)? All systems applying for the Delaware Procurement program must have a Delaware certification number for their solar array, or obtain a Delaware certification once the array is built. I am bidding on an RFP to build a system, can I enter it into the solicitation even though I haven’t won the RFP? There is a bid deposit requirement of $100/kw for all proposed systems that do not have a Delaware PSC certification number by the time the solicitation bidding closes. All systems must be completed within one year of the solicitation or be subject to forfeiture of this bid deposit. There is no requirement to demonstrate site control for any bid, however bidders run the risk of losing their bid deposit if they bid on a speculative project that is not completed within this one year limit. I have a leased system on my home with a 15 year lease term. Can I still apply? First, any host facility with a leased solar array is cautioned to ensure that they own the rights to the SREC stream from that array before bidding. Winning bidders are responsible for providing SRECs for the entire 20 year term and bidders should resolve any doubts regarding their ability to fulfill the contract term prior to bidding. Is a Delaware Parts and Labor Bonus paid in years 8-20? Yes. Systems will be paid based on their DE labor and equipment status throughout the term of the contract. The solicitation contracts are assignable and the seller can assign the contract to the new home owner by simply filling out and signing the necessary assignment forms available from the Program Administrator. Which facilities are eligible for the Program (who can participate)? Any facility with a Delaware certification number ratifying its eligibility for the Delaware market may participate. Delaware certification numbers are issued by the Delaware Public Service Commission (PSC). Facilities installed before 2010 will not have a “P” or “W” designation unless they have applied to the Delaware Public Service Commission for a revision. Facilities without a “P” or “W” designation will need to add “00” to the end of their certification numbers. Will there be another program in 2015? The Delaware Public Service Commission approved Delmarva Power and Light’s (DPL) filing for the 2014 solicitation. Another filing will need to be approved before running subsequent solicitations. The Delaware Renewable Energy Taskforce has been legislatively assigned to review and recommend changes to the design of the solicitations. They will likely review the results of the 2014 solicitation and incorporate any lessons learned in to the 2015 solicitation. In 2012 and 2013 this review process began immediately after the solicitation was complete with public meetings running for several months afterward, eventually leading to the 2014 filing. A similar process can be anticipated for this year.